OCTOBER 2018 • SPONSORED CONTENT • 33 The SelfCookingCenter ® . The perfect centerpiece for all American kitchens. The RATIONAL SelfCookingCenter ® combi-steamer is revolutionizing the way commercial kitchens operate. For more information go to: rationalusa.com at the 2018 NACS Show, Booth 6180. 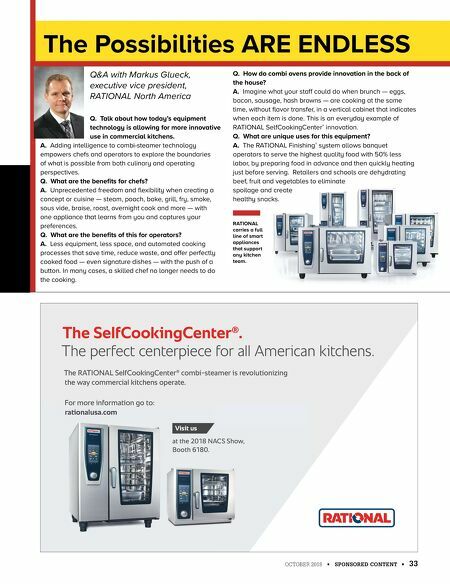 Visit us Q&A with Markus Glueck, executive vice president, RATIONAL North America Q. 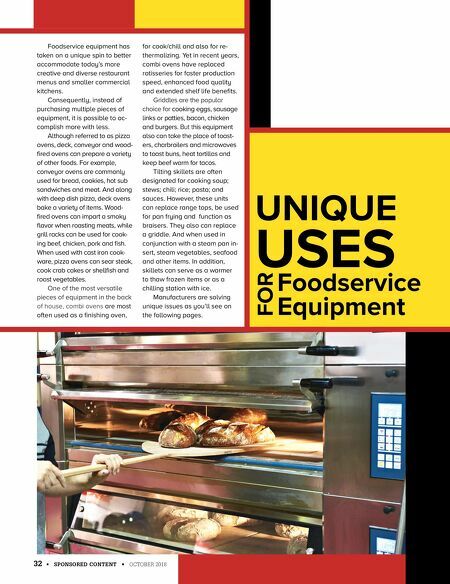 Talk about how today's equipment technology is allowing for more innovative use in commercial kitchens. A. Adding intelligence to combi-steamer technology empowers chefs and operators to explore the boundaries of what is possible from both culinary and operating perspectives. Q. What are the benefits for chefs? A. Unprecedented freedom and flexibility when creating a concept or cuisine — steam, poach, bake, grill, fry, smoke, sous vide, braise, roast, overnight cook and more — with one appliance that learns from you and captures your preferences. Q. What are the benefits of this for operators? A. Less equipment, less space, and automated cooking processes that save time, reduce waste, and offer perfectly cooked food — even signature dishes — with the push of a button. In many cases, a skilled chef no longer needs to do the cooking. Q. How do combi ovens provide innovation in the back of the house? A. Imagine what your staff could do when brunch — eggs, bacon, sausage, hash browns — are cooking at the same time, without flavor transfer, in a vertical cabinet that indicates when each item is done. This is an everyday example of RATIONAL SelfCookingCenter ® innovation. Q. What are unique uses for this equipment? A. The RATIONAL Finishing ® system allows banquet operators to serve the highest quality food with 50% less labor, by preparing food in advance and then quickly heating just before serving. Retailers and schools are dehydrating beef, fruit and vegetables to eliminate spoilage and create healthy snacks. The Possibilities ARE ENDLESS RATIONAL carries a full line of smart appliances that support any kitchen team.